Perhaps I wasn't meant to make a cookie this time. Perhaps I'm playing too close to hip on this one. Perhaps I need to go back to my very first inclination - ice cream. The clock is ticking and now all this thinking has lost me an hour. Think dammit, think! The cookies didn't fail, they just need a new venue. And the creamy ginger middle is amazing on its own so why hide it? A fast blend with the hand mixer, cookies turn to a yummy crunch, pop it all in the freezer and voila. 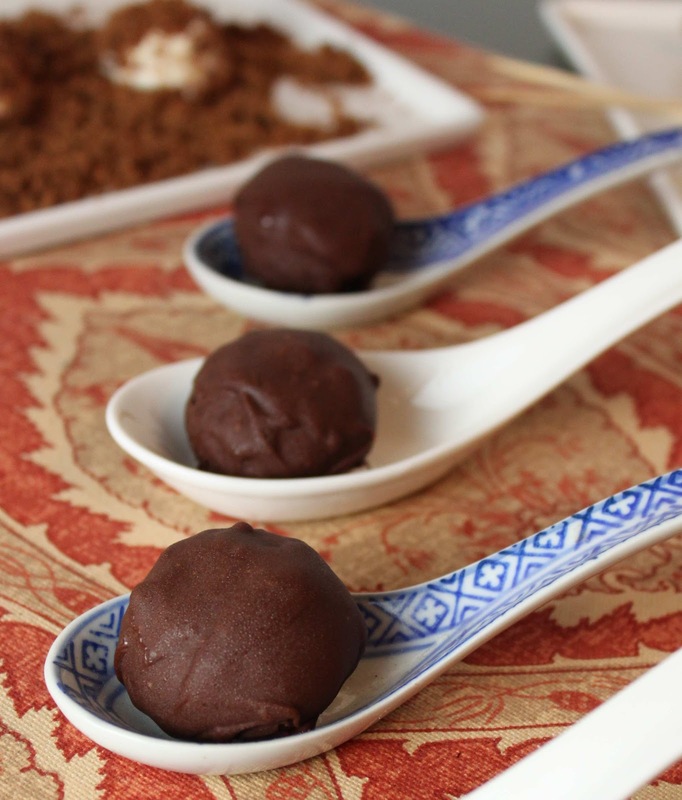 Mini Frozen ginger cheesecake nibs with the crunchy outside all covered in chocolate. Moral of the story? Don't name your recipe or write your post until the recipe is actually complete; you never know what Fat and Happy recipe you might end up with! Tips and Techniques: Work quickly because the cheesecake will melt easily; place the pan back in the freezer as needed. Grate the fresh ginger, place it in a small Cuisinart with the powder sugar and butter; blend until the mixture is completely combined. Place the ginger mixture in a large glass bowl along with the cream cheese, yogurt and vanilla. Use a hand held blender to combine everything. Line a cookie sheet with parchment paper. Use a small ice cream scoop to scoop the ginger ice cream into small balls, place in the freezer until solid. Roll the ginger cheesecake balls in the cookie crunch and then place back in the freezer to re solidify. Melt 1 cup chocolate with the shortening (this will help the chocolate be slightly runnier, hence easier to dip and still allow the chocolate to harden) and then dip each cheesecake ball in the melted chocolate. Place them back in the freezer until ready to eat. Below is my version that worked well with these frozen mini cheesecakes. But feel free to use what ever molasses recipe you have. In a stand mixer, cream the butter and sugar together. Add in the eggs, molasses and beer and blend. Mix in the remaining ingredients. Either bake as cookies or spread in a pan and bake as a brownie. Then crumble half of the pan and place in a warm oven until the crumbs crisp up. Use as directed to roll the frozen ginger cheesecakes in. Please do take a moment to see all of my fellow recipe swappers creations at Burwell General Store. These look delicious! And must have such an incredible texture and cooling factor. Recipe well swapped! Those nibbles look incredibly good! I love how you changed this recipe to an almost ice cream treat! I love when these kitchen disasters turn into something great! I also wanted to do something with beer, but had run out of it- all thanks to a fun Saturday night and like you, I also waited till Sunday afternoon to make my recipe swap creation! These nibbles look delicious! These look like perfection! So glad, as always, you join in the swap - I love your twists on everything! I think these would be a real crowd-pleaser! yum...so many great elements. great job! Lordy am I in fancy company...how does one even approach an 'oozing center'? If I were to get close enough to fail at that I'd consider it a mass success! And out of almost failure comes triumph clearly with your swap redo. These look beyond yummy and so sophisticated. Love it! These are good. I made them this year and last to give out to my neighbors for Christmas. :) My wife really enjoyed them.